This is not the first time for ~ in the fields to visit Kilmartin Glen, but the first time to see the Temple Wood Stone Circle. 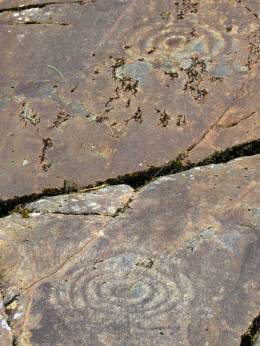 And noon is not the best time to visit the rock art – cup and ring marks – in Achnabreck, as the sun is too high up and does not allow the rings to cast the shadow. But they are stunning anyway, still – after 5,000 years.